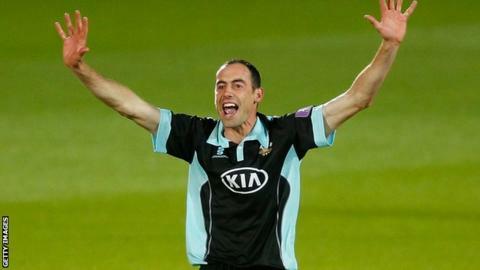 Surrey seam bowler Tim Linley has announced his retirement because of a knee injury. The Yorkshire-born 33-year-old made only one Championship appearance this season, and two in the T20 Blast. "Professional cricket was my dream job and the only one that I ever wanted to do," he told the Surrey website. "I feel incredibly grateful I was able to achieve that ambition and fortunate I have been able to lead the life that I always dreamed about as a kid." Linley made his first-class debut for Oxford MCCU in 2003 and made his Surrey debut in 2009 following a spell at Sussex. He took 73 first-class wickets for The Oval side as they won promotion from Division Two in 2011. In total he picked up 200 wickets at an average of 27.59 in 64 first-class appearances.